If you’ve read my blog for any length of time, you’ve likely heard me talk about this thing called Swagbucks. And some of you are probably scratching your head wondering what it’s all about. So I thought it was high time I did an in-depth tutorial complete with 15 simple ways to earn more Swagbucks. Swagbucks is a search engine which rewards you with Swagbucks for searching. You can use it just like Google (though I still like Google better) for searching and you will be randomly awarded Swagbucks for searching, usually around five to 10 Swagbucks once or twice each day. These Swagbucks can then be redeemed for a variety of different free items, such as Amazon gift cards, Starbucks gift cards and much more. While Swagbucks started out as solely a search engine, over the past few years, they’ve morphed into much more. In fact, they now offer many different ways to earn more Swagbucks making it much easier to earn enough Swagbucks to cash in on their prizes. How Do I Sign Up For Swagbucks? It’s very simple. Just fill out the form here and you’re all set. Resoundingly yes! I’ve earned many gift cards plus some electronics from them since I’ve been using them for the last few years. In fact, we were able to lavishly bless our families with Christmas gifts this year thanks, in large part, to the gift cards I’d accumulated through Swagbucks. And I’m not alone. I know dozens of friends who’ve also had great success with Swagbucks — earning at least a gift card or two every month and sometimes much more than that. Since I’ve introduced many people to Swagbucks through my blog, I have a great advantage because Swagbucks has an incredible referral program (you earn matching Swagbucks up to the first 1,000 each referral earns). However, even if you don’t have a large blog readership, there are many ways to earn Swagbucks without referring others. You can conduct internet searches directly on the Swagbucks homepage. 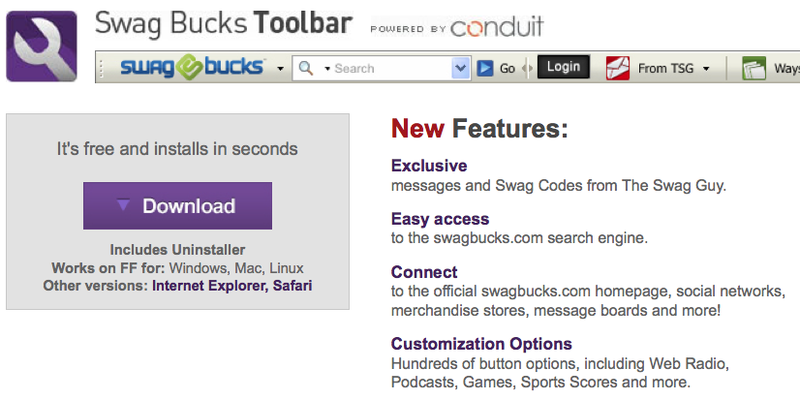 Or, you can make it much easier on yourself and just install the Swagbucks toolbar. Then, when you want to search for something, you can just go to the Swagbucks toolbar and search without having to open up the Swagbucks homepage. In addition, you’ll sometimes receive notifications of free Swagbucks codes in the toolbar which you can enter on the homepage of your Swagbucks account in order to add free bonus points to your account. If you’re not following the Swagbucks blog, you’re missing out on many opportunities to snag free Swagbucks codes. They have been releasing at least one free code almost every day. Plus, you’ll be in the know about giveaways they are running and everything that’s new at Swagbucks. If you have sites that you visit every day (such as MoneySavingMom.com, Facebook, etc. ), search for those on Swagbucks and then bookmark the results page. Go to the bookmarked results page every day instead of going directly to the site and it will instantly re-search for the page and you’ll likely rack up quite a few randomly-awarded Swagbucks each week by doing this. Update: One commentor said that she got a warning that her account was going to be disabled since she searched the same thing every day. So if you are searching for the same terms each day, make sure that you change things up and don’t just always search for the same three things every single day. Otherwise, your account could possibly be disabled. So, they don’t specifically address or forbid the bookmarking of pages you visit and search for, but it’s possible they could interpret it as being non-legitimate, especially if that’s all you ever search for. Wow, I had never thought of that bookmarking trick. Thanks! OK stupid here…I don’t understand the bookmarking thing. Can someone speak slowly and explain it to me please? Thanks! I guess I should say I have “favorites” but NOT bookmark? That’s why I am confused. I use IE. Yeah I’m not sure see how that would help, since it the actual search that would give the SB and not the clicking on the results? OH! I get it! I’m such a dum-dum. You put those as your boomarks and then it RE-searches for them everytime you click on it. Got it! Awesome! Thanks for this great post, Crystal! I’m fairly new to swagbucks and need all the help I can get to increase my bucks. How do you find the codes on the Swagbuck blog?? When they release one in the blog, it will tell you where to find it. YOu have to read the blog. Visit Swagbucks social medias like on Facebook Twitter. I’m not sure how to save my “favorites” or “bookmark” these sites on my swagbucks search page. I already have them on my favorites toolbar, but that doesn’t earn me swagbucks when I go to them from there does it? Can someone please give me the step-by-step instructions? Thanks! Only problem with this website is.. You might need to spend lot of time to get code..because you never know when and where they are going to keep the codes…you might need to spend lot of effort to get codes ( such as blogs, store, toolbar..etc)..
good thing is..if you don’t wanted to spend lot of time.. I am doing it..and earning $5 every month.. I average about 30 points/day just in searching my normal searches. It all adds up over time. Once you get the hang of it, its fabulous. Its FREE money. I am able to get about 15-25.00/month just from amazon. Plus, ANYTIME you purchase ANYTHING, scroll through & see if you can get extra points. For example, when Redbox had the Groupon sale the other day (3 videos for 1.00), swagbucks was offering 80 Swagbucks for buying that & going through their site. You just click on the link in their homepage & it takes you right through to groupon. Another site I have had great luck from is mypoints.com Similar idea, but more sites to purchase from, especially travel. If your going to buy something anyways, might as well ge a bonus! I have been able to ear about 75-100.00 per year in gift cards from mypoints. How many gift cards can you use in a transaction on Amazon? I have been reluctant to order their $5 card in case I didn’t have enough money in gift cards to apply to the order. There is no limit to how many gift cards you can use in one order. You can just keep adding the gift cards to your account until you have enough to cover your purchase. Yes, but you can only get 5 of the same thing a month, so it will take two months to get the $50. I get 5 $5’s, then start on the next month. About every 6 months though, I have enough to cash out for my 5 $5’s and 1 $50. Oh, i didn’t realize that you were only able to get 5 of the same item in a month, I guess what you do makes since. Is anyone other than me leary of having a site like that track your searching? I am concerned that we sign up to get some Amazon gift cards but “they” collect a lot of personal information from all of us….and we don’t really know who “they” all are. Maybe I’m just too nervous, but is there anyone out there with a computer tech background who can shed some light on this? For that matter, if you have a grocery or drugstore loyalty card, they’re collecting data on what you buy, too. Watch banner ads over free sites like Yahoo Mail after you’ve done some searching. They’ll be ads for sites you’ve recently visited. With cookies, spyware, trackers, etc., nearly everything you do is probably logged, by somebody, somewhere, whether you realize it or not. My SIL and I joke we need to wear our tinfoil hats when we’re on the internet! I would really advise against downloading the Swagbucks toolbar onto your computer. I did so thinking that it would allow me the opportunity to earn more Swagbucks. When our computer starting slowing down, freezing up and generally giving us trouble, my husband suggested that it might be due to the toolbar. He uninstalled it, along with some other programs. The computer ran fine. Then he had me re-install the toolbar. Immediately we began having issues with the computer. I discovered a way to earn more Swagbucks that seems to work well. I have my homepage set up as a Swagbucks search, so every time I open my internet browser, it runs that search. I have won as much as ten Swagbucks at a time by simply opening the internet. I downloaded the toolbar thinking it would be a great way to earn some more points. My Mac started having issues. I uninstalled it and haven’t used Swagbucks since. Interesting–I’ve had the toolbar on my home Mac and work PC for almost a year now and haven’t had any computer problems on either. I have never had a problem with the toolbar either, and I’ve used it for almost a year. I noticed mine running slower as well. Then got a nasty computer virus which was linked to the swagbucks toolbar. Same thing here. I recently got a Trojan from it and my PC is still not working right. When I uninstalled it I sent them a rather nasty email about it. I’ll continue using them for a few months to see if I can earn anything, but I’m just not feeling it to be honest. Back in the day I was a member of a few GPT sites & would cash out, through the few sites, at around a hundred bucks a month and that was only from doing free or trial offers. I’m trying to earn some extra “money” (Amazon cards) not trying to spend money. I’ve just noticed that things that even fall under the “trial” category aren’t always free trials. I’ve also noticed that the Daily Crave doesn’t work right for me, and the videos on the Watch section, I can’t even SEE them, even when I decrease or increase my in browser text. So I just gave up and don’t even try to watch them. I just let them play while doing other stuff. I’Ve seen them claim that you can earn up to 500sb a day via watching videos, I’m guessing it’s not possible to do that on a daily basis & rack up swagbucks that way because you have to wait for new videos to be put up on the site? Anyone have any tips for getting at least a $10gc each month without having to spend any money to do so? **WARNING** Don’t search (or “bookmark” search results) for sites you frequently visit (like moneysavingmom.com or ebates.com, etc) because Swagbucks could cancel your account. I’ve been doing Swagbucks for over 1.5 years & that was initially the way I made a lot of Swagbucks. Everyday instead of typing in https://www.moneysavingmom.com, I would just enter that into a Swagbucks search. Well, it caught up to me & Swagbucks cancelled my account because of it. When I e-mailed their customer service department to inquire about the closing of my account, they informed me that I had violated their user rules by performing “non-natural” searches in an attempt to earn more Swagbucks. After a little persuasion, I was allowed to keep my account, but was warned that if I was flagged again for this type of searches that my account would be permeanently cancelled. Now, I simply do the daily poll, the NOSO, & only enough searches each day to earn some swagbucks. Doing this I will earn approximately 11-15 swagbucks each day. Also, I will check the daily deals to see if anything I’m purchasing on Groupon is available to earn extra swagbucks (I’ve made a $4 purchase from Groupon that earned me 315 swagbucks before). Earning enough points for the Amazon gift card is slow going now, but I usually earn about 1 a month & that’s a lot better than my account being closed & not earning any at all. Hmm, do they have this in their written policy anywhere? I’ve not heard of this being a problem for anyone else. Thanks for sharing. I’ll investigate more. I have read their policy regarding “unnatural searches” but I don’t remember reading specifically what constitutes an “unnatural search”. I have a feeling it is left up to their discretion. Here is the quote from the swagbucks terms of service “Use of any robotic, automatic, programmed or similar entry method or searches that are not deemed by the Sponsor to represent legitimate use of the Search Services will void all entries and result in disqualification. Such non-legitimate uses include, but are not limited to: searches for letters of the alphabet, random numbers, or other irrelevant search queries; searches for the same word or phrase; any other searches which do not appear to represent a legitimate use of the Search Services.” So yes, it is up to them, but I think it’s safe to say that if you have the exact same search multiple times a day for weeks that they’ll catch it. I Love(d) swagbucks until the toolbar messed up my computer. Has anyone else had this issue?? That’s strange – I do pretty much the same 5 sites about 5 times a day (I have to reopen with everytime I open my computer back up) and have never had any trouble with this. I’ve been using them for over a year. My hubby and I both have an account so I don’t understand the one per household. We’ve had them for at least 18 months. Lana, if you’re caught at least one of the accounts will be deactivated. Yes, and you’ll lose all the points in that account — which can be a huge disappointment. Yeah, that happened to me. I wasn’t aware that both of use could not have an account so I opened one up for my husband and myself but when it came time to cash in our points they noticed that we were both living at the same address and they closed his account down. My husband and I did the same thing. When he went to place an order with his points his account was shut down and he lost all of his points. They will catch you! You can both still use one account on several computers. I have a laptop and a desktop and log them both into swagbucks for searches. I am pretty sure that there isn’t a problem with more than one person being logged into your Swagbucks account to earn points. I also had problems with the toolbar and had to uninstall it. Has anyone had trouble with the pages on Swagbucks not loading all the way? They will partially load and then I have to hit the “back” button, then go forward again and they will then load. It makes my time spent on trying to get swagbucks alot longer. Crystal, I can’t believe I’ve never thought to bookmark the search results instead of retyping the website/blog each time. Great idea! I’ll also vouch for Swagbuck being the real deal. Even though we don’t have a huge blog following (nothing like Money Saving Mom) we still have earned quite a bit from referrals. They do seem to taper off, but we try to remind our readers every once in a while. This seems to work best and most authentically when I get a great package from Amazon filled with free stuff from using Swagbucks. When I initially signed up, a month or two ago, i got my husband to sign up too not knowing it was one per household. I racked up quite a few swagbucks and ended up losing them when BOTH accounts were suddenly closed. Lost almost $25 of amazon GCs. Now I know better. It was such a painful experience LOL! Started a new account and buy my daily deals through swagbucks. I’ve redeemed $20 amazon GCs so far in just a month! I love swagbucks! However…just be careful! I think my facebook account was hacked by something associated with swagbucks, you were to go to this facebook page and “like” this company and you would earn swagbucks. I clicked on the link and decided not to “like” them. Later that day, scam posts were put on my facebook page supposedly by me, that I didn’t post. I have also heard people getting viruses from facebook stuff. The good part of swagbucks though- I have earned probably close to $400 in amazon gift cards in the last year (i do have some referrals). My facebook account was hacked too last week. I am not sure it was through SB, since I don’t recall doing what you mentioned above. However, I definitely have done the “like” offers for coupons on freebies though. Was clueless until my gf called me & asked how I got a free ipad!!! My bro-in-law told me to change my password & that seems to have helped. I’m keeping my fingers crossed. We have the “Safe Eyes” filter on our computer. Ever since we installed that I can’t use Swagbucks anymore. It will pull up results in the search engine but nothing happens when I click on it. Any ideas how to resolve this? I’ve already tried adding Safe Eyes to the “safe” list and that didn’t help. I just checked the website, and the only thing I could find was not to create multiple accounts for one user. Where does it say only one per household? I want to do what’s right, but I don’t see it listed anywhere. My husband and I both signed up a week ago, we have not redeemed any prizes yet. I just now saw where Crystal said only one per household. So, I checked the website too, I can’t find it anywhere about one per household. I only see multiple user accounts. I don’t want my account to get closed. Please help me find the info. It was one per household but now it’s one per person. I had the toolbar installed for no problem on my computer for about 4 months. The last few weeks my computer was really slow and freezing all the time. I uninstalled the toolbar and my computer worked perfectly again. I reinstalled the toolbar a few days later and instantly my computer freaked out. I have since uninstalled the toolbar again. I’m sad I’m not earning swagbucks, but my computer works great now. I wish the toolbar would go back to not destroying my computer. 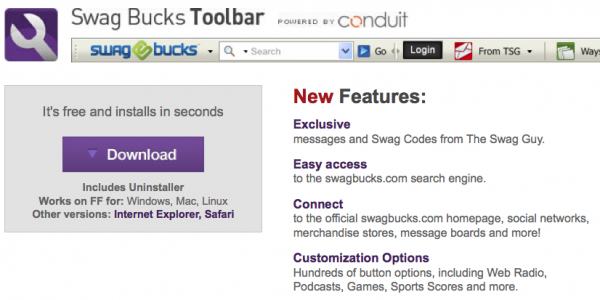 You can still earn Swagbucks without having the toolbar. Yes, the toolbar makes it easier to just type in your search from whatever page you are on, but even if you don’t have it, you can always just go to Swagbucks.com, log in, and search from there. I just tried to cash in Swagbucks for the $5 Amazon gift card yesterday, but they wanted my cell number for confirmation – well, my Cricket Wireless cell number does not show up as a cell phone in their database. I sent an inquiry to tech support but haven’t heard back from them. Anyone else have a similar issue, and how was it resolved? Do they always require a cell number to redeem Swag Bucks?? If that is the case, that’s enough reason to make me not want to continue right there. I don’t give my cell number out at all other than friends and doctor’s offices! I’ve never been asked for my cell phone number to redeem a swagbucks prize, and I’ve redeemed MANY $5 amazon gift cards. Every once in a while I see that pop up. I contacted customer service and they said it was to tell the real people from the robots. I told them I didn’t want to give that information and they processed by order without me having to give them my cell number. I’ve redeemed about 20 gift cards without EVER giving ANY sort of phone number. That’s bizarre. Don’t forget to check the drop down menu on your toolbar search box to make sure it hasn’t been changed to google or something else (my sweet hubby likes to use google, but forgets to change it back) Oh the swagbucks that have been lost by searching google by accident! I just read the entire swagbucks “Do’s and Dont’s” page, and while it said not to create multiple accounts for one user, it did not specify one user per household. Do you think that they have changed this? I don’t think it is fair that I would not be alllowed to utilize swagbucks if my sister also uses them and we happen to live in the same house. Maybe they’ve changed this policy! I’m only going based upon many reports that multiple accounts in one household were disabled and the points all lost. I think it’s better to be safe than sorry, so I’d suggest you and your sister just using the same account as together you could both accumulate quite a nice amount of points! I tried to access my account and I received a message that it has been deactivated. Why? As Crystal mentions, the easiest way to earn Swagbucks is through “referrals,” people who sign up for Swagbucks through your link. You get Swagbucks for their search wins, up to 1000 Swagbucks per referral. If you don’t have referrals, it is slow going to earn Swagbucks – I end up earning enough for 1 $5 Amazon gift card per week and that’s with a lot of work on my end. The cynical part of me wonders if bloggers posting about Swagbucks really want to help other people earn Swagbucks, or really are just looking for more referrals to earn Swagbucks for them. 😉 (same is true for Groupon and other site deals where referrals earn the referrer $). I appreciate that Crystal will sometimes mention that she does earn $ when you click her link and sign up through there. I am a meanie and never sign up on anyone’s link for anything b/c I don’t want people making $ off of me. My policy on posting referral links is this: “Would I post this deal if it didn’t have a referral link?” If the answer is yes, than I post it. If it’s no, I skip it. I want you to have confidence that what I post here is a good deal for *you*. I often also see you give the website address if we are not comfortable using your referral link. I have always found you to be upfront about this, and for all I have saved and learned, I don’t mind. I wish I had something interesting to write a blog about so I could do it! $5 a week is a lot of searching Kristan! It takes me about a month to earn $5 on my own with swagbucks (not that I’m complaining-I think it’s great extra money). With my referrals I can do it in about 3 weeks. Please share your secrets since you are able to do this without referrals. I don’t see a problem with people posting referral links. If people are inclined like you to sign up with swagbucks or any other program directly, it’s pretty easy to do directly to the site and do so. It takes a lot of time, effort, and resources to run a blog as big as Crystal does. Really it’s more than a full time job. By using her referral links, at no cost to us, we are supporting her and the great ministry that she has to all us. Cricket, it’s mostly not searching – Swagbucks TV, Special Offers sometimes, and the Daily Bucks (poll, etc), plus codes when I’m around to catch them. I only win searches 2-3 times a day. It does take a lot of work on my end – but it’s enough to pay for my diapers (I have 3 kids 3 and under, all in diapers at least sometimes), so that’s good enough for me! And I was under the impression that 1. Crystal earns money from us visiting her site b/c of the ads that appear and 2. that she has a team of people working on the site with her (I know that to be true, since she has mentioned it). Not to discount her service and ministry to us or the time it takes at all, of course! That’s so wonderful that Swagbucks is paying for your diapers. Woohoo! And yes, you are absolutely right that I earn money from ads on this site (we donate all the private ad sales to Compassion and Show Hope, which just thrills me to no end to be able to do!). So even if you never click on a link or sign up for anything through any link on my site, you’re still helping to “pay the bills” as well as bless some others in the process. I also earn about 1 $5 gift card a week and I get it done by watching Swgbucks TV. Whenever I’m on the computer I have it playing. It really makes a difference for me. OK I”ve never thought about trying Swagbucks TV. What exactly is it? Do you have to have the volume turned up? You can use either one Chris. Also, why doesn’t anyone talk about all the points you can rack up with printing/redeeming coupons through Swagbucks at Coupons.com? Click on a button for coupons under Ways to Earn on Swagbucks home pg. save money, and earn Swag Bucks! It is 100% FREE to print coupons, so don’t delay – the sooner you print, the sooner you SAVE! Chrystal has mentioned before that you can earn swagbucks for printing coupons through their site. I check about 4 other deal blogs daily and I must say that Chrystal is the only one that has mentioned printing coupons through Swagbucks. It kinda makes me mad at the other bloggers since they obiviously don’t want us to know about because it will effect their earnings. Chrystal will probably mention printing coupons in her 2nd part of this post. Yes, that’s a’comin’ next week, though it’s one of the few ways to earn from Swagbucks I have blogged about before. I’ve heard that people are starting to see the points show up in their account now, which I was happy to hear! When I joined SB today I read the rules of use, and they specifically stated that telling others about specific SB codes was against the rules. They said you could post a hint by letting others know WHERE TO FIND the code, but NOT the actual code. So I wonder how that site you mentioned manages to get away with that? I deleted the comment which included a link to that blog because you are exactly right: it is against the Swagbucks policy to share specific codes unless they’ve given express permission to do so. Jenn: I edited your comment because the site you posted is in direct violation of Swagbuck’s rules. I’m sure you didn’t know that, so just so you know, Swagbucks does not allow you to post or share codes without express permission. You can, however, tell people where to look for codes or give them hints. Swag bucks is a wonderful way to augment a tight budget, however, you should transfer all earned rewards as soon as they show up in your account. I lost $60.00 in my account when I was deactivated for using an iframe bot. I had to ask my son who is a software engineer what an iframe bot was, even he was not familiar with them. I have been unable to get anyone at swag bucks to even look into my case which is a shame because I really enjoyed swag bucks. And I have occasionally had trouble with the results page loading, but not consistently; it’s just a once-in-a-while glitch. I’m curious how you all are getting $25-30 worth of SB a month just searching. I consider myself to search a *lot*, and I average around $5 worth. Do I not search as much as I thought, or am I missing something?